Every week I get emails from travel writers asking me where to pitch travel stories. Which magazines are the best targets for their query letters? Through my writer’s coaching business I work with several dozen novice travel journalists, and I notice the one thing they also struggle with is finding the right magazines to pitch their stories to. The process of figuring out where to pitch travel stories confounds most writers at the onset of their career. In light of this, I devoted an entire chapter to this topic in my marketing book, The Complete Guide to Marketing and Selling Your Travel Articles. Many magazines will be obvious choices for where to pitch travel stories. They will just leap out at you. I’ve sold dozens of travel stories where the match-up between my story idea and a magazine just seemed so perfect that all I had to do was write an enticing query letter and fire it off to the editor—and then wait for the acceptance. Many, many times it has literally been that easy. Here are some examples from my magazine archives where to pitch travel stories. These are ideal story/magazine pairings that practically sold themselves. 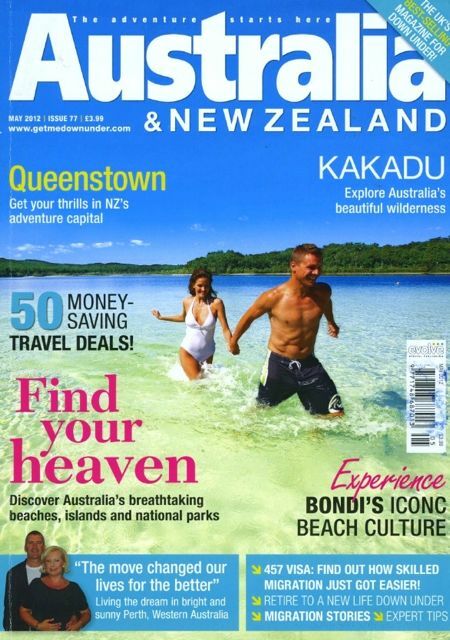 • My stories about New Zealand’s two major tourist resort areas—Rotorua and Queenstown—easily sold to Australia & New Zealand Magazine. This was a slam-dunk. The magazine picked these stories up overnight—and paid well too! • My story about a four-day beer cruise in the Puget Sound on a historic 126-foot long schooner was also a done deal with Beer Magazine. In fact, I had three magazines express interest in this story. • My story about a deluxe Balinese vegan resort and spa sold immediately to Vegan Fitness Magazine. • My story pitch about three ghost towns in the Columbia River Gorge sold easily to Columbia Gorge Magazine. This was such a natural fit. • I sold a series of 19 marina destination stories to a regional yachting magazine—another natural fit. 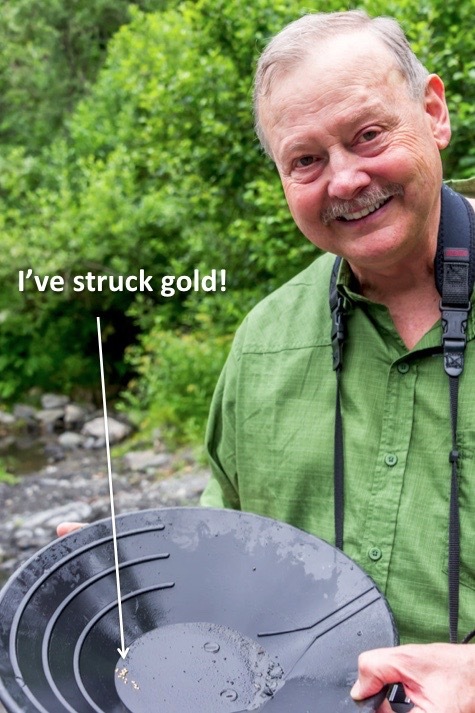 • A series of historic mining town stories was snapped up by Lost Treasure Magazine. • A story about the World War II Bletchley Park Codebreaking Center in England sold quickly to Monitoring Times Magazine, a ham radio magazine—another great fit. • A story about England’s Royal Signals Museum sold to Popular Communications Magazine, a ham radio magazine. In fact, two magazines wanted this story. • A story about Seattle’s Museum of the Mysteries sold pronto to Mystery Magazine. Go figure! • A story about the Sequim Lavender Festival sold rapidly to Pacific Horticulture Magazine. • A story about military museums in Edinburgh Castle sold to Scotland Magazine—one would certainly hope so! I think you get the idea. There was something just so right about pairing my story ideas with these magazines. Having pointed out that some magazines would seem to be a perfect fit for your story, I need to temper this with a grim reality of freelance writing. I have often been surprised at how many magazines that I believed would jump on my story, actually ignored my pitch altogether. This is why I always recommend that you always send your query out to 20-25 magazines—you need to cover all your bases. But, take heart, because there’s also another way to focus in on potential magazines to pitch travel stories. When I have a travel topic in mind, and I’m looking for where to pitch travel stories, I’ll often work by process of elimination. Obviously, some travel story ideas will not be a good fit for some magazines, so those magazines are removed immediately from my distribution list. Removing some magazines from your distribution list is an effective technique. It gets the ‘unlikely’ magazine candidates off your list so you won’t waste your time sending them query letters. When I’m trying to sell a luxury destination travel story, I would not bother pitching it to budget travel magazines. Budget travel magazines are simply not interested in high-end travel stories—their readers want to travel cheaply, and will not go to expensive destinations, resorts, or restaurants. If my proposed story is about a new super-deluxe international resort in Bali, I will pitch it to high-end glossy magazines that run spa and resort stories. If I was pitching a story about an inland luxury attraction or destination, I would not pitch it to ‘Islands’ or ‘Coastal Living’ Magazines. I would target inland regional and state magazines instead. If my proposed story is about a new—but relatively minor—tourist attraction in my region, it would not be a good fit for international magazines. Nor would it fit into magazines from other states. I would turn to local, regional, and in-state publications to pitch this story, and eliminate the magazines outside those boundaries. Most of this boils down to using your common sense. But you would not believe how many inappropriate queries magazine editors receive every week. It’s probably their biggest complaint. When there's a theme, where you might pitch travel stories is a little different. You have to be very selective about your choice of target magazines. If one of my stories has a particular emphasis—such as military museums—it would clearly not be a good fit for most standard travel magazines on the rack. So I would query this story to military magazines with museum sections. Spend a little bit of time thinking about which magazines might be interested in your theme. Look for niche magazines where you can pitch your travel stories. There are a few more places to look to find where to pitch travel stories - to help you zero in and finalize your list. You can look at the magazine's Writer’s Guidelines, (that is, if they actually have them). Writers Guidelines spell out very clearly what types of stories they prefer and just as importantly, what they don't want. Writer’s Guidelines can usually be found somewhere on the magazine’s website, so keep digging around until you find them. I also refer to my Writer’s Market book for potential magazines to pitch. This thick tomb contains thousands of magazine leads, and I’ve found plenty of juicy magazine prospects here. The magazine listings here contain abbreviated versions of their Writer’s Guidelines, so pay attention to what they do and do not publish. I always do an Internet search for the magazine genre I’m writing about. I’m constantly amazed at how many magazines I uncover online. I have found many solid leads for where to pitch my travel stories that resulted in published stories. Another excellent source of magazine leads is my eBooks. They will speed up the search process for you tremendously and save you a lot of time. How to Break Into The Luxury Travel Writing Market - Lists 21 Luxury Travel websites & 55 Luxury Travel Magazines. There are a number of other sources, including databases, for tracking down magazines for your travel stories. They are outlined in my marketing eBook, The Complete Guide to Marketing and Selling Your Travel Articles. It may take you a day or more to assemble each list, but once you have it, you only need to update it occasionally, as you discover new publications. How Many Magazines to Pitch for Each Travel Story? For each travel story I pitch, I like to come up with a list of 25 outlets. Through trial and error, I have found that it takes this many magazines to get positive results—in other words, to get my story accepted for publication. Sometimes, I pitch far more than this. For example, I regularly send my running and triathlon training queries out to 50+ magazines. It's a numbers game. The more pitches you send out, the better your chances of seeing your article published. It's that simple. If you are in doubt about whether to pitch a magazine, send your query. I have been pleasantly surprised many times when ‘long shot’ magazines have picked up my stories, and ‘dead cert’ magazines have completely ignored my queries. 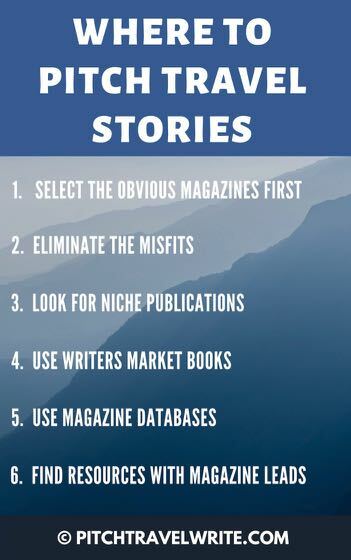 The good news is that after you've been doing this for a while, you'll be able to tell almost immediately which magazines will be good targets for your stories, and which won't. After years of going through this process, I can now decide in a few seconds whether a magazine will ‘work’ for a story idea, or not. And, as you get to know the magazines, you won't spend much time making these decisions either. Good luck and just keep pitching!